The Preserve at 620, a unique office opportunity in Northwest Austin has delivered. The project is a first-of-its-class modern office building offering 225,000 square feet located at 8201 North FM 620 in Austin, Texas. Corning Optical Communications LLC (Corning) signed a lease for approximately 52,000 square feet at the property in December of 2018. Corning is a leading manufacturer of fiber optic communications system solutions, and Zane Cole, Bre Brown and Reid Mauro represented the company in the transaction. This lease, combined with approximately 43,000 square feet leased to IAS, means the property was over 40% leased upon delivery. 130,000 square feet of contiguous office space remains available for lease, representing one of the only existing large blocks of space on the ground and ready for tenant improvements in northwest Austin. Corning plans to occupy in the second quarter of 2019. IAS has finalized its build-out and is preparing to relocate into the building now. 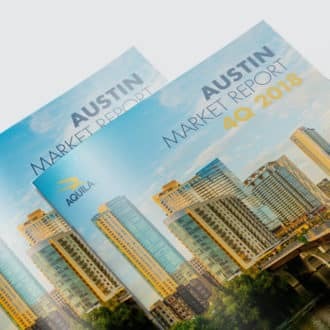 “The early leasing activity was a great validation of a new concept in the Austin market. We’re equally excited by what we see on the ground today. We really believe the aesthetics and experience on site will set the standard going forward for what office tenants expect from modern space,” says Ben Tolson, Principal with AQUILA Commercial. Preserve at 620 involved the total transformation of a former Super Walmart. Following a national trend of converting well located large warehouses and big box retail into alternative uses, the shell of the Walmart structure presented a unique opportunity as a single-story office development. The property offers tenants a large, contiguous floorplate with high ceilings and natural light which invites community and efficiency and allows for some very desirable economies of scale. The location along FM 620, near FM 2222, backs up to the Balcones Canyon Preserve and provides convenient access to Austin’s most desirable neighborhoods and executive housing, as well as Lake Travis. A number of restaurants and amenities including Moviehouse & Eatery, Napa Flats Wood-Fired Kitchen, Freebirds, Nik’s Italian Kitchen, Starbucks, ThunderCloud Subs and more are in immediate proximity to the project. Preserve at 620 features a single floor plate with 23-foot ceilings and a system of over 100 skylights. In addition, the property offers a rich tenant experience with numerous amenities, including abundant parking, a series of covered and uncovered parks and courtyards, a premier fitness center, a dog run, games lawn and a sports court. PacVentures owns the project. AQUILA Commercial is leading the redevelopment and leasing efforts. Nelsen Partners is the project architect, and S. Watts is the general contractor.